If you have a body composition goal & you have to eat out at restaurants every now and then, all is not lost. You can still make very good choices without blowing your entire diet, while still enjoying yourself, if you just focus on a few key points. In this post I’ll discuss ways that you can go out to eat yet still ensure you’re both enjoying yourself and staying on track as best as you can, eating to support your goals. The best thing about the Internet is that we have instant access to information. Usually restaurants have their menus listed online, and what I would suggest is that you decide on the place and search through their menu quickly to see what they offer. If you have a body fitness/body composition goals this will make it a bit easier and you’ll feel more confident going into this situation knowing what to order. I recommend after you take a look at the restaurant’s menu, pick out two or three menu items that are acceptable for your goals and then decide when you get there. This will narrow down your options but also provide leeway in case the restaurant is out of your primary selection or you change your mood/mind. While I’m not saying you should pick the lowest calorie option (of course depending on your individual goal), there will often be 2 dishes you like equally where one may have just half the calories of the second. In this case, it’s simple logic to pick that one, but if you don’t review the information in advance you will never know. An little hack I often tell my clients is to drink a whey protein shake, prior to going out to a restaurant. You’ll still be hungry enough to enjoy a big feed but it will take the edge off that extreme hunger, which can often result in poor decisions. Lots of current studies have revealed that due to the structure of protein, it has a satiating effect, meaning you feel fuller for longer. By having some protein (even just a small can of tuna or a protein shake) prior to departing, you can ensure that you are getting a good amount of beneficial protein while also reducing the risk of overeating once you get to the restaurant. Another good little hack if your goal is fat loss and you are going out to eat, is to drink a couple glasses of water before leaving to go out. Interestingly, a study actually determined that when participants drank 2 cups of water before meals, they ate significantly less food compared to participants who did not drink the water. Drinking a large volume of water prior to and with your meal can take up some of the limited space in your stomach. This will give you a feeling of fullness earlier on, allowing you to consume less total food. Another reason is that having a large amount of water can stretch the stomach meaning reduced secretion of the hunger hormone, ghrelin. This will allow you to feel less hungry when you get to the restaurant and more likely to make better decisions. Other research has shown that a glass of cold water can even boost your metabolism by 50+ calories for that day. It’s honestly just a good idea overall to drink lots of water & often! If you’re stuck at a restaurant with less than optimal choices, consider eating as much salad as possible. By filling up on salad, you reduce the amount of volume in your stomach left to accommodate other foods that may not be as healthy or very high calorie. Eating lots of salad will also provide a good amount of fibre since vegetables are fiber dense. Multiple studies have shown that fiber is essential not only for digestion but also for feelings of being full. By filling up on fiber-filled vegetables via salad, you’ll leave feeling satisfied and confident that you ate healthily. It’s alos a good idea to ask for salad dressings that are lower in calories such as vinaigrettes. While some creamier dressing variants can include upwards of 14 grams of fat per serving, most light vinaigrettes come in around 4-5 grams of fat per serving. By simply choosing a lighter dressing option, you can significantly reduce the total amount of calories you are consuming. Unless you are eating at a fast food restaurant, most establishments offer both lean protein options as well as substitutions of vegetables for a side. It’s always a good idea to choose these as your options since they will benefit you both in terms of nutritional density as well as satiety. Opting for both a lean protein and fiber-filled vegetable source is a no-brainer for the best option while eating out at a restaurant. I also recommend this option if you plan on doing 2-3 courses, or drinking alcohol. 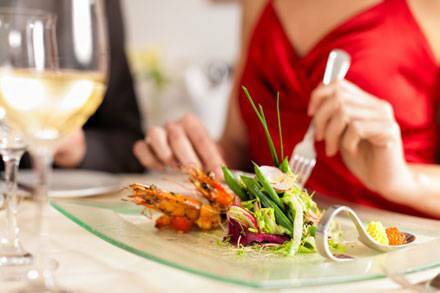 By keeping your main entrée low calorie and based on protein/vegetables, you have more flexibility for a starter, dessert or an alcoholic drink. Many restaurants offer delicious dishes that include lean proteins but then greatly increase the calorie content by smothering them with high fat, high-calorie sauces. This is in addition to high-calorie dressings often paired salads. I’ve seen many salads labeled at over 1000 calories. If this is the case, you may as well just eat a burger, right?! To ensure your efforts aren’t ruined by crazy high-calorie sauces, I suggest you request they place the condiments such as salad dressing, barbecue and other sauces on the side when you order an entrée. By using this method, you can control how much of them you are actually consuming, potentially reducing the total amount of calories for the meal. In a restaurant or at home, research has shown the slower you eat the less you eat. The reason being that taking time allows your food to digest and your brain to receive signals of fullness. While this may not matter if you are eating a typical healthy meal at home, it can be a great rule when you are eating high calorie and super tasty food in a restaurant. The best and most common techniques are to drink water between bites, chat more and chew your food slowly. This alone may save you 20-30% calories! The final tip is to pick your treat. What I mean by this is pick what you really want most of all and allow yourself to have one “unhealthy” or “empty calorie” thing, whether it’s the starter, entrée dessert or alcohol. Instead of having all four and consuming 4000 calories, be smart with all your choices, and then allow yourself the option of having the most desired thing as a “free” treat without worrying about the calories etc. in that one thing. For example, you may have a low-calorie salad as a starter, a high-calorie main, such as a burger, then pass on a dessert and just drink a diet soda. Or you might keep it all healthy but go a little crazy with the dessert. That way, you’ve got a healthy balance, enjoyed yourself, but have not gone over the top and wrecked the hard work of your whole last week’s training!